Complete Name: Intellitec Relays Brief Information: Diesel Battery Isolator Relay Delay (I.R.D.) 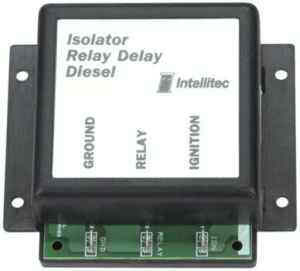 Complete Overview: INTELLITEC'S Battery Isolator Relay Delay - Diesel offers a new approach to charging, isolating and jump starting dual batteries in an RV which has a diesel engine requiring up to 800 amps of starting current. Unlike conventional diode isolators, this system provided the engine driven alternator with the opportunity to begin charging the chassis battery before connecting the coach battery. This allows the use of self-exciting alternators and lets the engine briefly warm up prior to placing the load of a heavily discharged coach battery on the alternator. This system also ensures equal charging voltages on both batteries, regardless of current draw, preventing overcharging of the coach battery when heavy chassis current is being supplied. A remote (dash mounted) switch can be added for a coach battery Jump Start feature. The unit is packaged in a plastic enclosure for mounting in the engine compartment with four flathead screws. It operates in combination with an intermittent duty cycle isolator relay, similar to ones used as diesel starter solenoids. There are three (3) wires to connect to the delay unit, one from an ignition switched 12 volt source, a ground and the isolator relay coil. It operates by sensing the level of voltage on the chassis 12 volt system. When this voltage goes above 13.3 volts for approximately 12 seconds, as happens when the engine is running normally (normal alternator output voltage is approximately 14.4 volts), it will close the isolator relay providing charging current to the coach battery. The controller engages the relay at full voltage, and then reduces it allowing an intermittent duty cycle relay to be used continuously. When the ignition switch is turned off, the relay will open immediately. If the voltage should drop below 12 volts for more than two seconds while running, the relay will drop out. This might happen when the alternator is not able to supply sufficient current to all of the loads. If the chassis voltage goes above 13.3 volts again, the relay will again close in about two (2) seconds to re-try and charge the battery. The resultant flickering of lights would alert the owner of the system overload.